It is that time of the year again! Boulder averages 88 inches of snow each and every year! Residents of the city know that they must prepare well ahead of time in order to save themselves from the snow and the ice that it leaves behind. Icy sidewalks are always of concern in Boulder. Slips and falls on ice can cause serious injury, even death. How can you get rid of icy sidewalks and prevent those injuries from happening? With a bit of time and a few of the following helpers, you have everything that is needed to quickly remove ice from the sidewalks. No, don’t go into the kitchen and grab the Morton salt and pour it on the ground. Instead, head to the home improvement store and purchase snow salt. This special salt works to melt snow and ice quickly. Alternatives to the salt, if you are unable to get out to purchase it, include ashes, sand, and cat litter. Obviously the easiest way to get rid of snow and prevent icy sidewalks is with a shovel, but do not start this task unless you’re ready for a challenge. Shoveling snow takes time and persistence. Plus, you need to have the salt on hand (or your chosen solution) to melt the ice once the snow is gone. It is also a good idea to have an ice chipper on hand, or at a minimum use the shovel to break the ice. The safest, smartest ways to get ice off of a sidewalk is to hand the job over to a professional company. 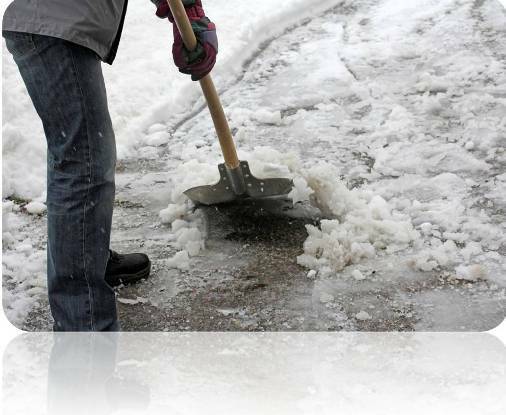 Professionals are able to quickly and easily remove the ice and snow from the sidewalks and you can stay inside where it is nice and warm and there is no harm of you falling and injuring yourself. Professionals have the right tools and right equipment. They are well prepared for the job and more than willing to get you out of an icy situation! It is easy to find a company offering affordable snow removal in Boulder, co, so why not let someone else take care of the problem it is what they are paid to do, after all. Once you’ve successfully removed the snow and ice from the sidewalk, it is important that a second layer of salt (or snow melt) be placed on the sidewalk to prevent ice from building again. If you hire a professional for ice removal, they’ll take care of this secondary step for you. Before you step onto the sidewalk, make sure that it is safe. Ice is so slippery and it is very easy to fall on. A slip onto the hard ice could result in some serious body soreness, or worse, severe injuries. Make sure that you are able to stand on the ice and that there is something nearby for you to hold onto or grab in the event that you start to slip. Before you know it all of that snow and ice will be long gone. Until then, use these tips to keep you ice-free!